By the 18th century woodcut had become largely obsolete for making fine prints. While line engraving remained the principal technique – followed by etching, mezzotint and, later, aquatint – woodcut declined to poor-cousin status, the preserve of cheap and popular moralising prints and other ephemera such as broadsides. Hogarth hoped to exploit the lowly standing of the woodcut to his advantage. So he embarked upon a project to design a series of prints – to be cut on wood by John Bell – that would have a wider circulation than his more expensive engravings on copper, and ideally reach his target audience among the lower classes. As he stated in his Autobiographical notes, these prints required ‘neither great correctness of drawing or fine Engraving’. The planned set of woodcuts illustrating the Four stages of cruelty was never realised in its entirety; only two woodcuts (reproduced here) were made before the project was abandoned as unsuccessful. 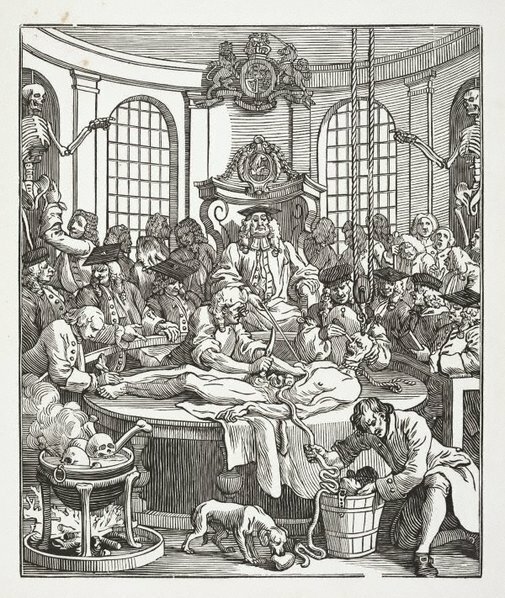 Hogarth did, however, go on to publish the complete set of four (smaller) prints in an engraved version. The images were intended from the start to have a reforming purpose. As Hogarth explained: ‘The four stages of cruelty, were done in hopes of preventing in some degree that cruel treatment of poor Animals which makes the streets of London more disagre[e]able to the human mind, than any thing what ever, the very describing of which gives pain.’ Hogarth’s moral message could not have been more forthright: cruel children left unrestrained grow into cruel adults. The Four stages of cruelty relates the career of Tom Nero, a child of the slums, who begins by torturing dogs, progresses to beating disabled horses in the street then, as a grown up, murders his pregnant lover, Ann Gill. The scene for Cruelty in perfection is a churchyard at night, where Nero is arrested as the body of Gill lies on the ground, her throat slit, amid a bundle of plate she stole from her mistress at Nero’s request. Hogarth’s title for the ultimate print, The reward of cruelty, belies the macabre finale to a life devoted to barbaric acts. In this work Nero is dissected in an anatomy theatre by surgeons as an executed criminal, a noose still around his neck. The chief surgeon sits in the centre in an elevated chair and prods the body with a pointer. As if in judgment, with the royal coat of arms above him, this aloof figure is also a reminder that the law had the power to impose punishment beyond death on hanged criminals by making dissection part of an official sentence. The surgeons appear to display a degree of relish in the gratuitous dissection of Nero’s corpse, an enthusiasm comparable to that which Nero had exhibited in his extreme and sadistic infliction of cruelty on animals. Ironically, he is now the victim, and a dog prepares to feed on his heart. Prints & drawings Europe 1500-1900 , Sydney, 2014, p 84, illus p 85. Unknown, Hogarth’s graphic works , London, 1989, pp 148–49, 151–52, no 190/1, illus p 378. Unknown, Hogarth's graphic works , New Haven, 1965, vol 1, pp 214–15, no 190; vol 2, plate 279.